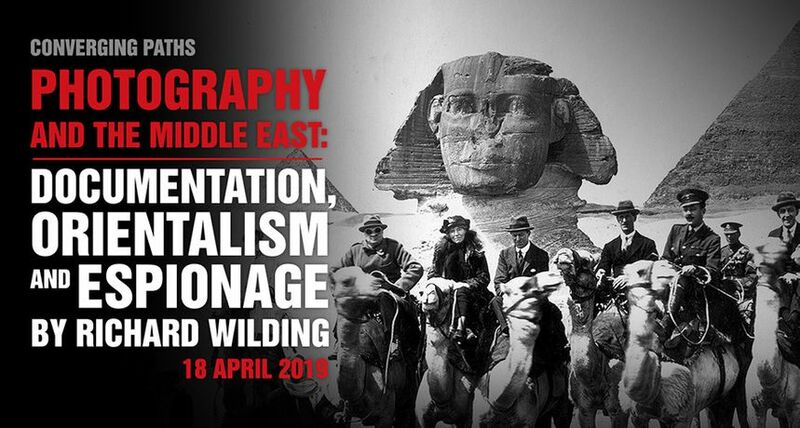 In this illustrated talk, co-curator of the exhibition ‘Departures’ Richard Wilding contrasts the legacy and objectives of historical photographers with his own contemporary work and experiences in the region. During the nineteenth century, exciting new archaeological discoveries in Egypt and Mesopotamia generated great enthusiasm in Europe for images and written accounts of these lands. Enterprising studio photographers such as Félix and Lydie Bonfils followed the tradition of Orientalist painting, creating staged and often highly exaggerated depictions of costume and lifestyle. Other photographers such as K.A.C. Creswell and Anthony Kersting documented the Middle East's architecture and heritage in a way that was both thorough and respectful. Feted travellers such as Gertrude Bell, T.E Lawrence and Max von Oppenheim combined photographic documentation with a passion for archaeological discovery and covert diplomatic service to their respective countries. In his own work, Richard Wilding follows in the footsteps of these historical photographers. After his presentation, Wilding will be joined by a panel of specialists in historical photography and heritage documentation to answer questions and participate in a lively debate with the audience. Richard Wilding is a London-based photographer and filmmaker specialising in the documentation of cultural identity, heritage, archaeology and costume in the Middle East. He is currently working on long-term projects in Iraq, Kurdistan, Saudi Arabia and Egypt. Wilding’s photography has been exhibited at the Houses of Parliament, Courtauld Institute of Art and University of Exeter in the UK and in Erbil and Sulaymaniyah in the Kurdistan region of Iraq. He has coordinated exhibitions of historical photography in Jeddah and Madinah, Saudi Arabia. Wilding has given public talks at Leighton House Museum and the Ismaili Centre, London. He has given lectures for the Reconciliation and Peacebuilding programme at the University of Winchester, for the Department of Archaeology at the University of Reading, for the Sackler Research Forum at the Courtauld Institute of Art, London and at the University of Exeter’s Institute of Arab and Islamic Studies. Since 2012, Richard Wilding has been Creative Director of Gulan, a UK registered charity which promotes the culture of Kurdistan. He is a trustee of the Mansoojat Foundation, a charity formed to collect and document the traditional costumes of Saudi Arabia. Wilding is currently working with the Egyptian Heritage Rescue Foundation in Cairo on a pioneering project to film the conservation of medieval minbars in Cairo, using modern 3D printing technology to replicate fragments dispersed in museum collections and reinstate them in their original locations.